We offer air cleaners in portable, ambient, source capture and down-draft configurations. Ambient capture systems are designed to create an air pattern to capture air contaminants without the use of hoods, ductwork or input from your employees. Sized to provide the proper number of air changed per hour, an ambient system eliminates the need to exhaust your air contaminants. Ambient systems are also much more affordable compared to ducted, source capture systems. Our ambient systems are available in self-cleaning cartridge units and media units equipped with disposable filters. Source capture systems are designed to capture the air contaminants before they become airborne. Through the use of hoods, enclosures, and airflow, source capture provides the most effective means of controlling pollutants. Downdraft systems are designed to capture air contaminants and draw them down away from the breathing zone. Micro Air offers self-contained downdraft tables in a variety of sizes or unpowered tables designed to be ducted to a central clean air system. Our XA series downdraft tables are an effective method of capturing air contaminants and are much more affordable to implement compared to a traditional ducted system. 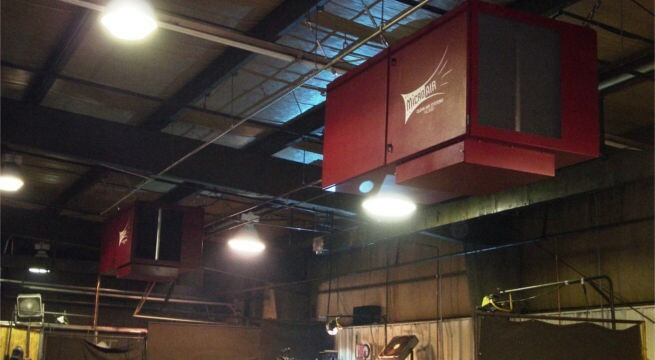 The XA downdraft tables are ideal for weld schools and training centers.